Chris Masci, owner of New England Open Markets, chatted with Barbara Rietscha, owner of Stow Greenhouses. 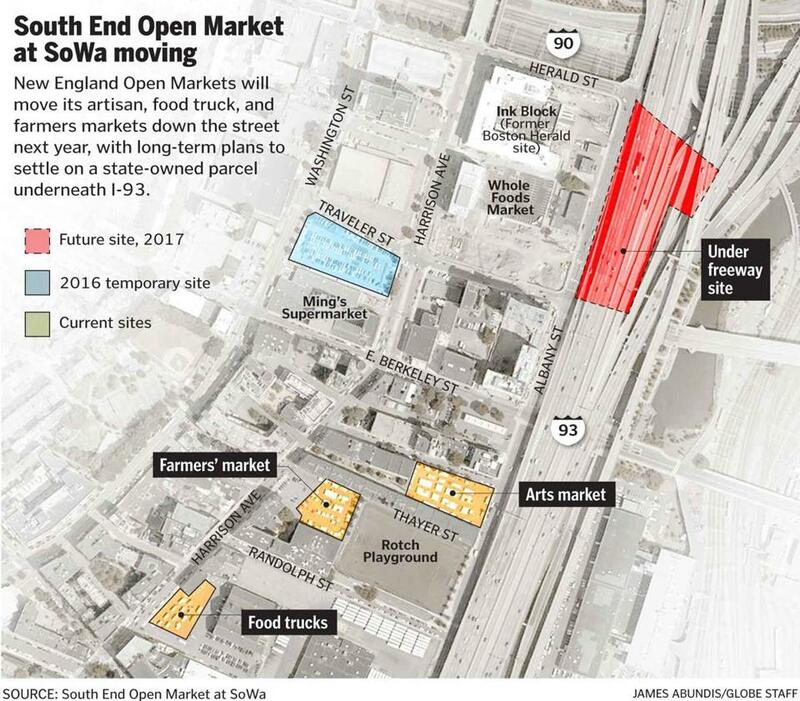 The South End Open Market at SoWa will move to a new location next year. On summer and fall Sundays, millennials, families, and suburban empty-nesters seeking a dose of urban cool flock to the “SoWa” district in the South End. They’re bound for hip markets on Harrison Avenue where artisans hawk handmade jewelry, vintage clothing, and produce. But behind the scenes, the feel-good vibe fades. Instead, the market that began in 2004 with a handshake deal is splintering this month in one of the city’s uglier recent business divorces. Chris Masci, owner of New England Open Markets LLC, will temporarily relocate to a site near the Ink Block development. 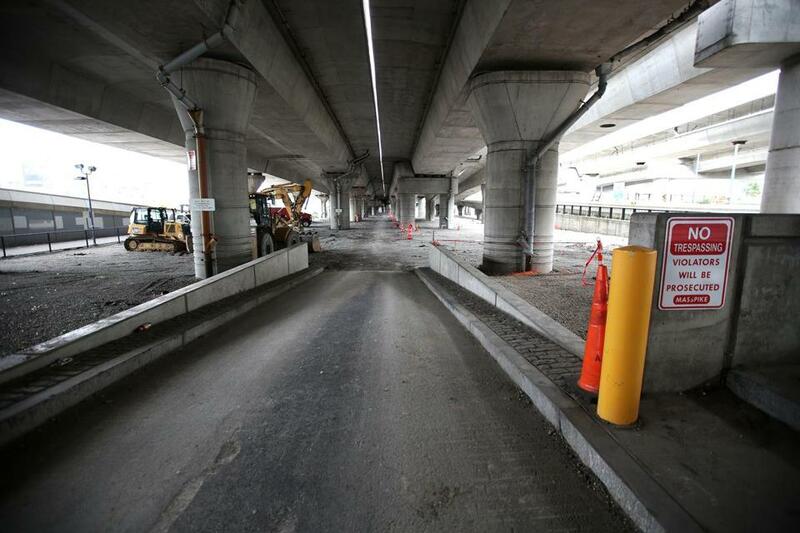 His vendors will eventually move to a grimy parcel under the nearby Interstate 93 overpass that, while slated for refurbishment, will almost certainly test his vendors’ loyalty and his customers’ appetite for industrial chic. Crowds moved along Harrison Avenue on Sunday. Mario Nicosia, who owns the property where the current market sits, plans to launch a rival outdoor market. A prominent South End developer, he already counts a popular vintage market, artist studios, retail shops, and several restaurants as tenants in old brick buildings he has refurbished there. That seems to be one of the few things the two men agree on. Masci’s market, which runs from May to October each year, started in 2004 with just a handful of crafts vendors. A few years later, he agreed to take over management of food trucks and a farmers market that Nicosia had run on the Harrison Avenue property. Together, the offerings sprawl over several parking lots and are augmented by artists studios, a vintage memorabilia market, and other retailers in Nicosia’s buildings. They routinely draw 10,000 people a week, and Masci’s open-air markets generated $361,000 in fees from vendors in 2014 that he split with Nicosia, according to court records. The trouble began in 2013, when Nicosia’s company, GTI Properties Inc., trademarked the “SoWa Open Market” name; SoWa refers to “South of Washington Street.” Masci had earlier sought the same trademark, but allowed his application to lapse. “I felt betrayed because I had been using ‘SoWa Open Market’ to identify my business for a good amount of time,” Masci said. Masci filed two lawsuits in early 2015: one challenging the trademark and another accusing Nicosia of recruiting vendors in a scheme to cut him out of the market. Masci also started referring to his markets — the craft, food, and farm vendors — by their original “South End Open Market” name, an attempt to re-establish his own brand. Nicosia responded with a notice of default, saying his lease required Masci to use the SoWa name. Nicosia denied trying to recruit vendors, and said he was acting to protect the SoWa name, which he coined in 2000 and spent heavily to promote. He said Masci maneuvered to end the lease early so he could move and take the vendor fees for himself. The sides agreed to a short-lived truce in April: The lease would end this year. Masci would drop his lawsuits and his challenge to the SoWa Open Market trademark, and use a compromise name for 2015: “South End Open Market at SoWa.” Nicosia agreed to have no communication with Masci’s vendors, other than to coordinate parking and maintenance. He also lowered the rent. But then Nicosia filed his own lawsuit in July, saying Masci was withholding GTI’s cut of fees collected from vendors who failed to show up on rainy days. That case is pending. Masci has since teamed up with National Development, which built the large Ink Block complex nearby. The company has arranged for Masci to use a parking lot across Harrison Avenue from the block next year. 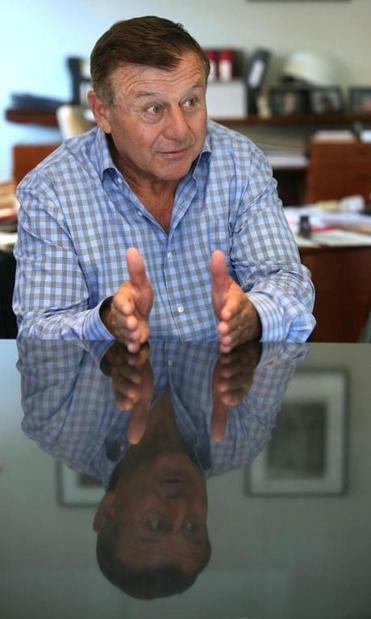 GTI Properties Inc. chief Mario Nicosia vows to undercut his rival’s rates. Moreover, Nicosia said Masci failed to recognize that the success of the Sunday markets was due in large part to the setting provided by his company’s property. Some vendors at the market on Sunday said they would follow Masci, for now. Combining the various vendors at one location — they are spread out over several blocks — would be a big improvement, they said, since customers who come to browse one section won’t miss the others. Vendors interviewed Sunday were not aware of the plans to move underneath the overpass. But all agreed the market must remain in some form. For most, it’s their sole retail presence. Some customers reacted with uncertainty to the move, saying they would sample both markets next year. But mostly, they wondered, why change anything at all? 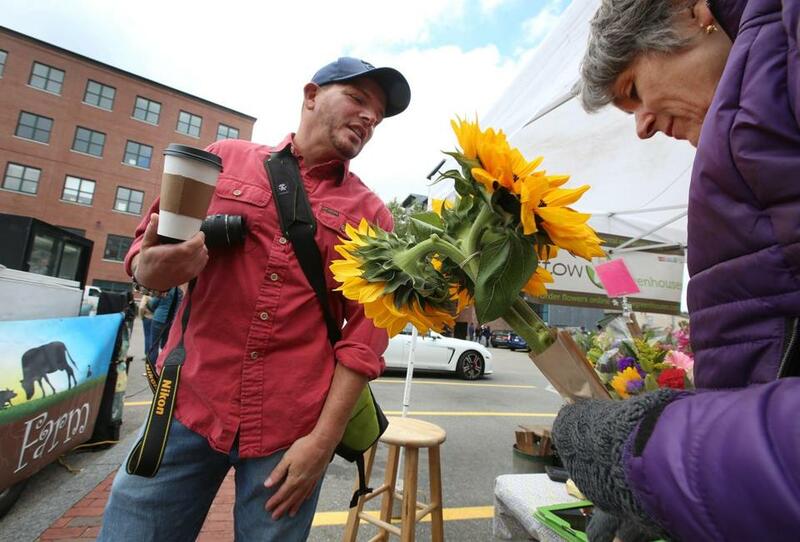 “Why can’t good things just stay the way they are?” sighed Nancy Peck of Concord, who frequents the market with two friends whose children have also left for college. Plans call for the South End Open Market at SoWa to move to this lot under Interstate 93 in 2017.